The DST800 is the market’s first Retractable TRIDUCER® Multisensor offering depth, speed, and temperature in a single, 51 mm (2”) fitting. Only one hole through the hull simplifies the installation—an attractive feature for boat builders and boat owners alike. Patented, speed-signal-processing enhancements provide excellent paddlewheel accuracy below 5 knots (6 MPH) and smooth linear output at all vessel speeds. The transducer’s wide, fan-shaped, fore-aft beam is able to find bottom even when installed on steep deadrise hulls or heeling sailboats. 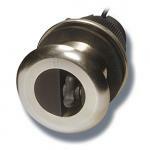 You also get true water-temperature readings with the DST800’s reliable temperature sensor. The DST800 is an Analog TRIDUCER® multisensor that offers depth, speed, and temperature functions in..